I don’t know about you guys, but I often find myself stuck in a snacking rut. It’s likely because I go grocery shopping and buy all the things for meals but completely forget to buy goodies for snack time. So more often than not, we’re snacking on cheese and chips, and that gets boring, fast. Don’t get me wrong, I love cheese. LOVE cheese. But a girl needs diversity in her snacking repertoire, which lead me to raid the pantry and discover I could make these amazing no-bake chocolate nut butter granola bars. These things, I mean, man, they are just so good. 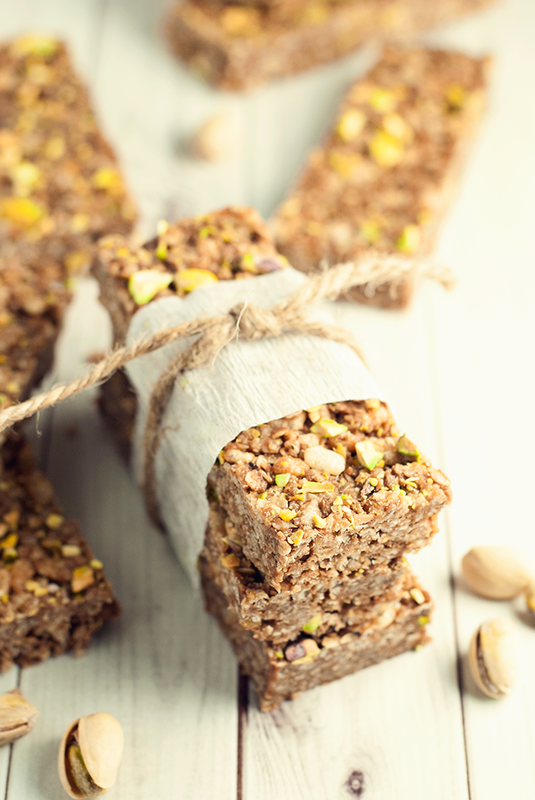 Like the best of all worlds in terms of granola bars. They’re chewy, yet crunchy. They’re sweet, but also salty. That is what I call delicious. Plus! There is just a smidgen of chocolate in there. Just a taste. It tangos with your taste buds and says a shy hello. And you know it’s there, but just barely. Like a passing thought. Pistachios are my secret weapon. Well, not so secret, since you can see them, obviously, in the granola bars. But they are just a wonderfully flavored, powerhouse nut. Also, this is the only way I get to eat any pistachios, because Rudy hoards them like they’re going out of style. He also eats my granola bars like they’re going out of style, but since I make big batches, I manage to get a bar or two myself. Yay me! 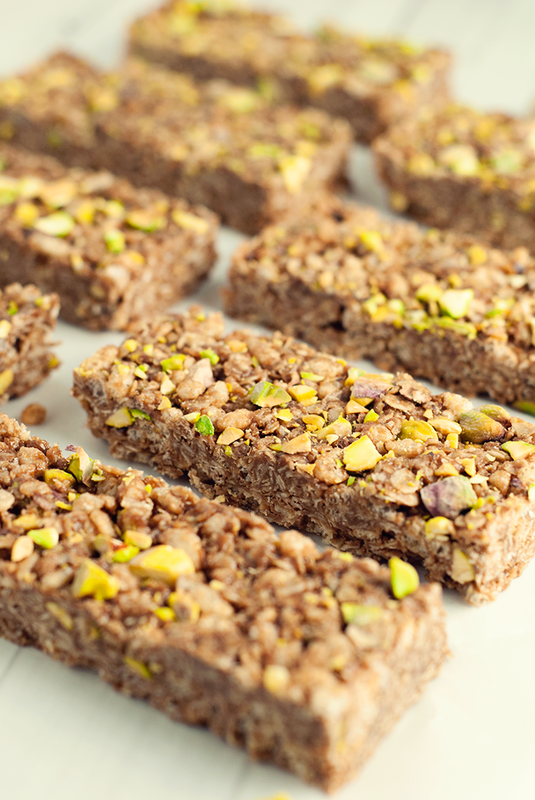 Throwing together these no-bake chocolate nut butter granola bars is so easy, just put some nut butter (I use cashew butter, personally) and honey in a pot on low heat and melt the two together, the add cocoa powder, then the oats, then finally some puffed rice cereal and the pistachios. Stir it all together then press it into a foil-lined 13×9 inch pan and cool in the fridge for a couple hours. Easy as pie. I like to save half of the pistachios to press into the tops of the bars, just because I really like the way it looks. It’s aesthetically pleasing, ha. 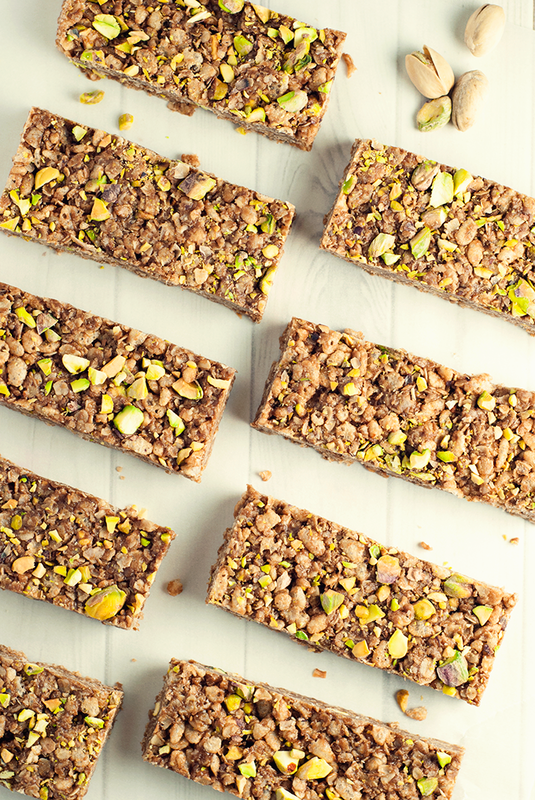 But I also like that when I bite into these no-bake chocolate nut butter granola bars, I get the crunch and taste of the pistachios first. Yum. Ready to make these for your next snacking adventure? Line a 13x9 inch pan with aluminum foil, set aside. 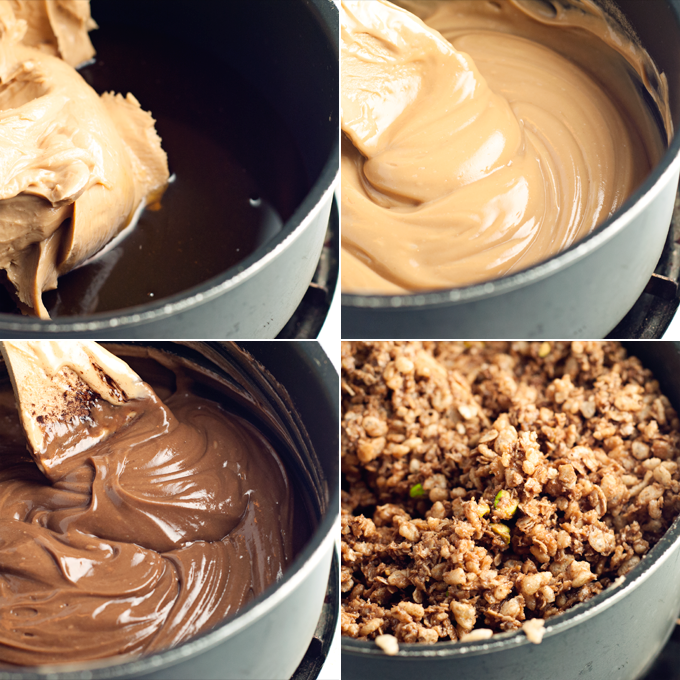 In a large sauce pan over medium-low heat, add the nut butter and honey and melt, stirring frequently, until combined. Add the cocoa powder and stir until mixed. 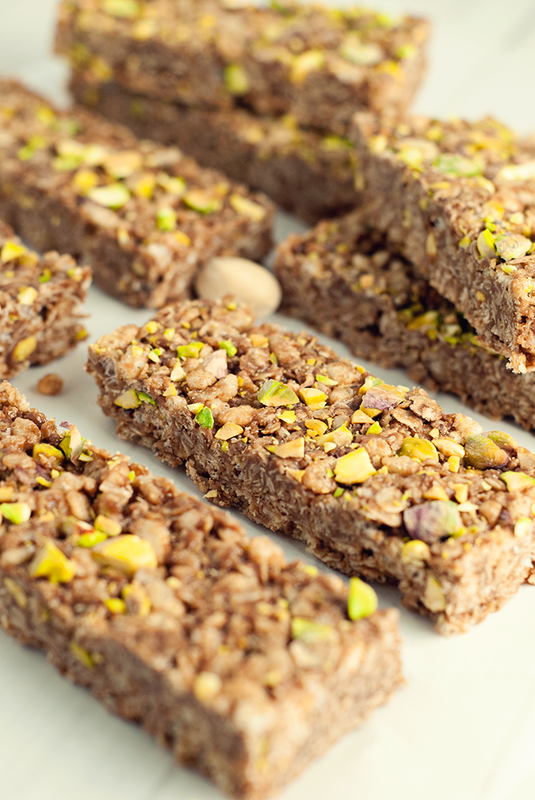 Remove from heat, then add the quick oats and stir until coated, then add the puffed rice cereal and 1/2 cup of pistachios and gently fold into the mixture until everything is fully coated in the chocolate nut butter mixture. 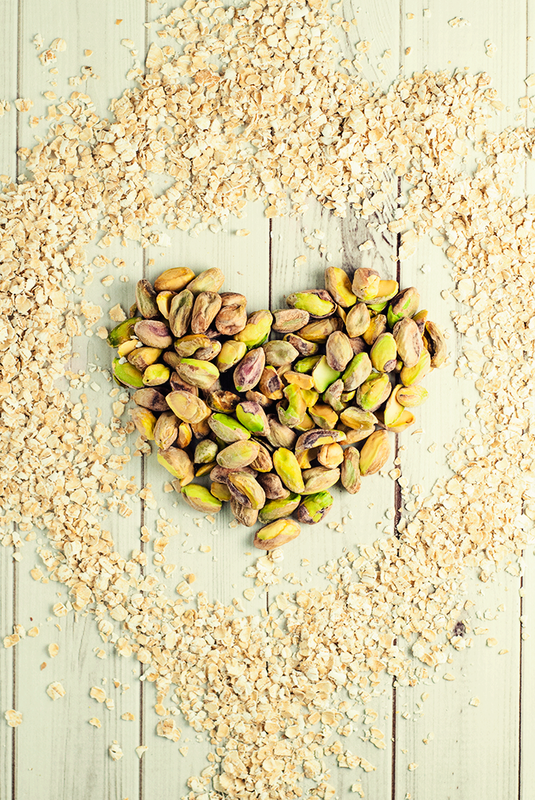 Using a flat spatula, press the granola mixture into the 13x9 pan firmly, then sprinkle with the remaining pistachios and press down one more time. Cover and refrigerate for one hours, or until cool. Remove from pan, cut into bars, and enjoy! Now tell me, what do you just love in your granola bars? Are you a fruits person? S’mores? Nutty to the max? I want to know! Awwww maaaaan.....these look delish. And super easy!I think I need to make these for my kiddos today since we have a snow day and are home from school. They are out sledding right now, but they will come home hungry! Yeah, you have hot a$$ summers there in Texas and we have cold a$$ winters here in PA! Which is worse? Since I experienced AZ summers for 8 years, I am in a quandary as to the answer to that question?!?! ?Your pics look amazing! Stoppin' by from Food Blogger Pro. These sound great! Thanks for linking up at Found & Foraged! I have similar recipe. Adding pistachios, cool idea. Trying next time I make bars. I stopped buying the store bought ones when I discovered I can make myself. Thanks stopping by from The Better Baker Link Up. 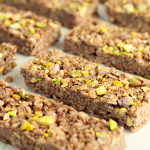 I've never seen pistachios in a granola bar recipe. I bet these make a really tasty variation! Thank you for linking up the recipe at This Is How We Roll Thursday. Hi Karly, These looks delicious. Shared...Thanks for coming to the party and hope to see you again this week!